Right after you have bound your mesh(es) to your Avastar Rig. You must refresh the internal data of your character whenever you have edited the verts or the weight maps. Avastar does not do this automatically, because updating the reference meshes takes a lot of computer time and it is not easy to find out when an update needs to be performed. When your mesh needs an update of the reference mesh, the double arrow icon is marked with a red background. Note: Avastar only checks if the update might be necessary. So this is less a must do and more a gentle proposition. Avastar uses a reference mesh for each mesh that it has bound to an Armature. This reference mesh is used to calculate the shape and the skeleton for each slider setting. The reference mesh is created when the Mesh is bound to the armature. However, sometimes you want to edit your meshes after you have bound them to the armature. But this may result in a topological difference between the expected reference mesh and the true mesh. They can have different sets of verts, edges, faces. And they can have different Weight maps. And for sure they will have different shape. Because of this, the reference meshes must be updated after editing the meshes. 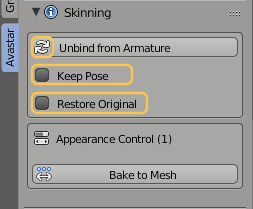 Note: If you see a number surrounded by parentheses within the Unbind from Armature button, this is the number of mesh objects which will be unbound. If no number is displayed then only the active Object is unbound. The number in parentheses in the Appearance control label tells you how many of the selected custom mesh objects will be affected (1 in the image above). The visual appearance of a mesh can be controlled by shape keys and modifiers. However sometimes it is necessary to have the visual appearance baked into the mesh geometry so we can transfer the mesh as it appears to Secondlife. The Update Reference mesh operator (see above) is not suitable for this task because it keeps the shape keys intact. That is why we have added the quickfix Operator Freeze&Rebind which also handles the baking of the Shape keys. 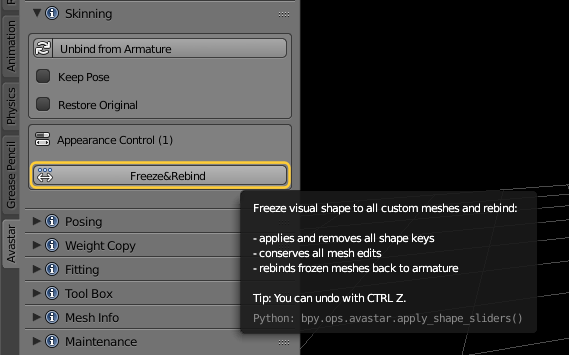 Tip: You can freeze Avastar system meshes with the Freeze operator in the Avastar Tool Box.